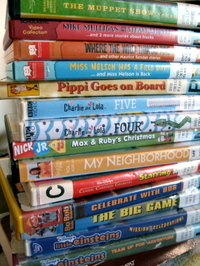 Yesterday I'd planned to quickly pop into two stores with Monkey and Princess, and then hit the library - to return a few things that were due. About seven steps into Barnes & Noble my cell rang. Thomas had gotten a bloody nose at school and it wouldn't stop. Drop everything and drive the 45 min. to pick him up. And of course his nose had stopped by then and he was fine. Took him back home for lunch, followed by no naps (for me - I really wanted one!). It was a long afternoon, and last night after taking Princess home from dance we realized she 'd left her dance bag (with her ballet shoes) at the studio. Back I go. And then I finally made it to the library to return stuff. Between Princess and I we'd checked out 15 dvd's for our Thanksgiving trip. Thank goodness Little Einsteins was never requested. I'd checked it out for Emergency Purposes Only. Charlie and Lola, my new favorite show, was a popular one, though. Thomas climbed into bed with us at about 2am - feeling much too warm. Pulled out the dye-free motrin. Monkey climbed into bed with us at about 3am - he didn't have a fever, he was just feeling chatty. Finally got him back to his bed at 3:30 - or so - now the times are all blurring. To top it all off, my kids are already all hopped up on Christmas. Last night this morning Monkey saw a light from a passing car and got very excited: "It's Santa! Yes it IS! It's Santa!" When I finally convinced him it wasn't he said "Oh, it's a spaceship." I didn't argue with that one. He's also been carrying around a basket full of lego pieces. "I have everything I need for Christmas. Santa will bring me a castle for my guys." Thank goodness this is the last day of November - December could be a really long month. At least we can start our advent calendar tomorrow. Have a good weekend - I'm going to go hit the excedrin. Bad News: The night before we left for Thanksgiving, Thomas accidentally broke Violet's head off. Princess was crushed. As Monkey said, "She fwied and fwied." Her dolls really are her friends. 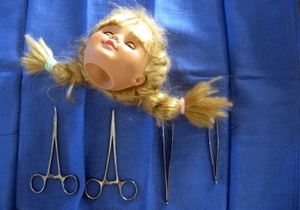 Good news: We took her with us, and after a fairly major procedure and consultations with Papa and at least one uncle, Aaron was able to reattach her head. Bad News: Her head is still rather floppy. Princess is much relieved that her head is ON and is playing gently with her. She has reconciled herself that Violet may need to rest up on a shelf. Santa may need to send a new doll for Princess (that's bad news because of how it hits the wallet - and I had Christmas all planned!). Good News: Princess got her cast off! Her foot is free! I can't believe it's been five weeks since she hurt it. It went quickly, thank goodness! She needs to take it easy for the next week, and she's limping a little, but she should be good to go after that. 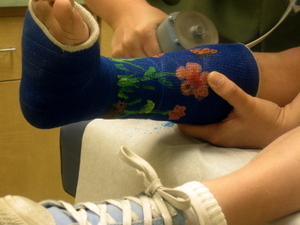 BTW, her doctor was suitably impressed with her cast - and laughed at the blue toenails. We're back from a pleasant Thanksgiving trip to see Aaron's family. Hope you all had a great weekend, too. We're not in full Christmas mode yet - The Grinch has been watched (and read), I pulled out all the Christmas books, a couple of holiday CD's and changed the pillow covers. Not much else as of yet. It'll come. Yeah, that isn't nearly all of what's on my list.... must find it! This month I'm trying to read out loud with Princess every day. We used to do that, but have gotten out of the habit. Last December we tried to re-read all of the American Girl Christmas books (I think my favorite is Molly's). This year we started with Chapter 2 of Little Women (When the family gives their modest Christmas breakfast to a family that has none). And then Princess took the book to bed with her (Yay! It's an amazing thing to pass on your favorite books!). I thought I'd try and find a couple of Little House Christmas chapters, too. Does anyone else have any ideas of Christmas-y segments from books? I also want to do more cooking with her. She found an American Girl (Felicity) cookbook at her Nana's house this weekend and set out with Nana to make Sally Lund bread. It turned out delicious, and I want to make more 'historic' food with her. Actually, I think I have the 'Louisa May Alcott Cookbook' - I'll have to dig that out! 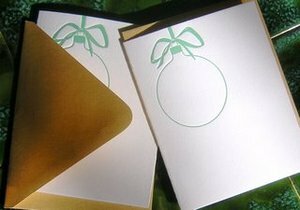 Wishing you all luck with your own Christmas lists - because I know you have them, too. 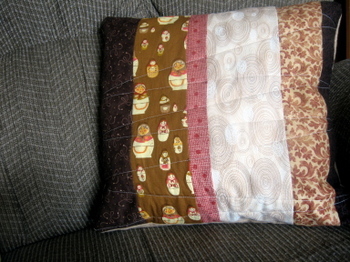 A quick quilted pillow cover - made from pieces found in my scrap box. 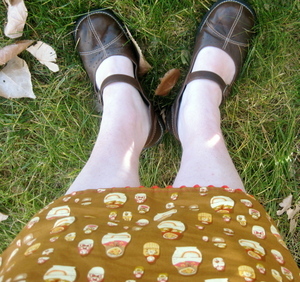 You'll notice a scrap from my skirt - and most of the rest is from Kris and Jenn's quilt. Very quick, but I like the results - hopefully she will as well. Happy Thanksgiving! I'll be in and out for the weekend, so I've set a couple of posts on timer. Sweet. 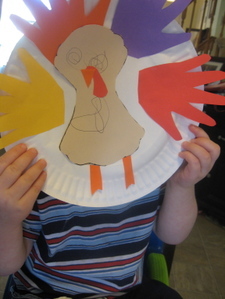 This is Monkey's turkey - it was the take home project from a library Storytime. Don't look directly at the eyes. It'll probably hypnotize you. Monkey fully recognized that because of how the project was 'supposed to' go together, I did more work on it than he did. 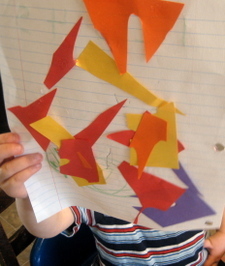 So he used the scraps and made another turkey - for me. I like his better. Monkey won't let me hang up his turkey. He prefers using it for snacks. 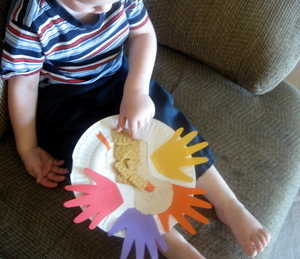 It is made out of a plate, after all. 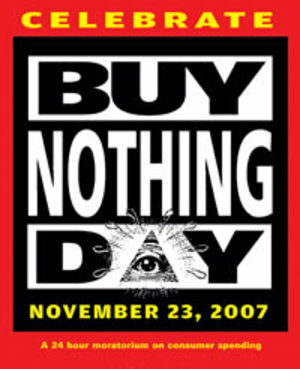 And remember, tomorrow is Buy Nothing Day! 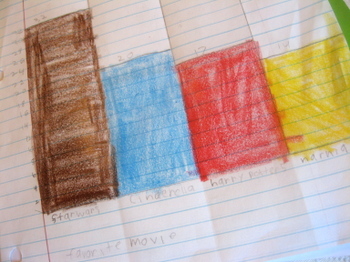 First we learned how to make tally-marks and how to draw a graph. 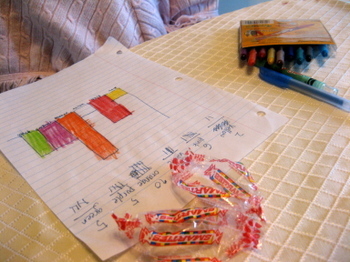 We practiced by graphing two rolls of smarties, yum. Then Princess read through all the comments (and giggled several times - you guys are so nice). Then I read the votes out to her so she could tally them. We were surprised that Cinderella came in second - we both thought it would be Harry Potter. Thanks again for helping us out with this - you made it really fun! 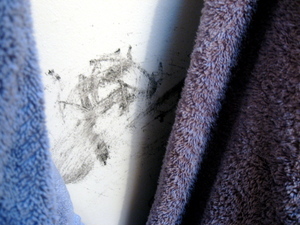 It was on his face, on the bathroom wall and on his* shirt! And I had to buy more mascara! 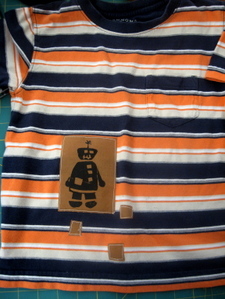 To salvage the shirt, I pulled out this little robot stencil that was waiting for just such an occasion. 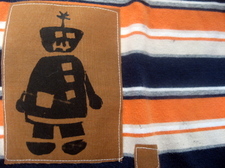 Once when I was stenciling I decided to just freehand a couple of quick robots to use as patches - and what do you know, this one fit just right. 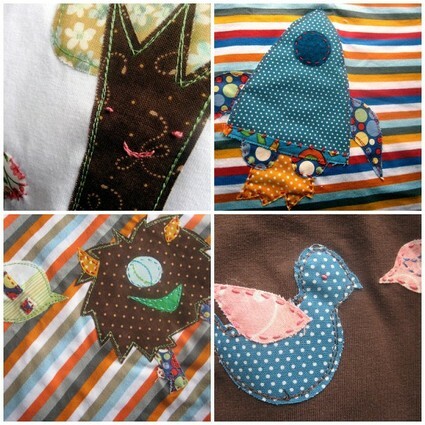 Not a lot of crafting around here of late, I know (I always wonder, am I boring those who come here for crafty posts? 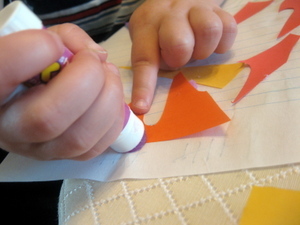 Or when I do more crafts am I boring the readers who come here for mommy/autism/homeschooling posts?). Anyway, the crafting drought can be attributed to various causes, including everyone being sick, my sewing table being buried under craft supplies, and (this one's good) our furnace dying and having to go without heat for a few days. It did get a little chilly here, but not too bad. We are now the proud owners of a new furnace and water heater, because apparently that was dying, too. 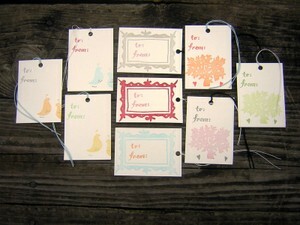 And just so you know, holiday crafting is in full swing here - lots to show you soon! Okay, so the whole Fall Skirt thing isn't really happening. Oh well. I'm still resorting to my jeans or cords most days. 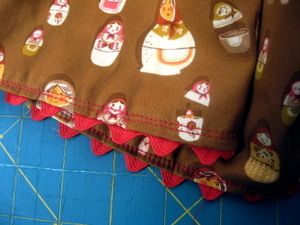 But I did finish another skirt - probably just for church, but that's okay. 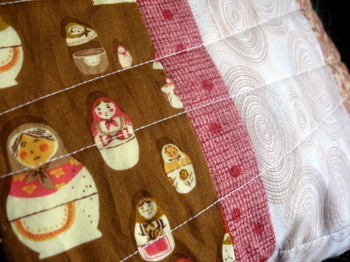 When I saw a flickr photo of a skirt made from Heather Ross' Matryoshka fabric, I just HAD to do it, too. I added some red ric rac to the bottom edge, which I think is fun. Yeah, I love stuff that goes with everything! Shoddy workmanship, but the end result is fun. 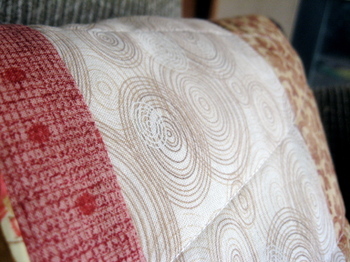 And I still ADORE working with the Heather Ross fabric. It's SO soft! Aaron: Is that what you made last night? Aaron: I like it! It looks nice, it hangs well, and I like the trim on the bottom... (thinks for a moment)... Ric Rac! Ha! I remembered what that stuff was called all by myself! Me: Yes, dear. 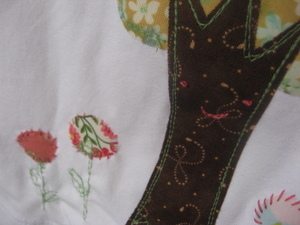 Congratulations, you're definitely married to a crafter.